Mastery Prep Elementary opens in Fall 2018 in North Philadelphia. It will serve over 200 students in grades K-2 and grow each year to grade 6. Prep Elementary offers children academic excellence in a fun, joyful environment. From math to music and reading to field trips, our students receive a well-rounded education from loving teachers and leaders. We focus on 5 core values: respect, responsibility, hard work, teamwork and kindness. What is the name of the after care company? Mastery Prep Elementary will partner with “Change 4A Dollar” after care program. We believe that this organization would be the best match for our school. “Change 4A Dollar” will operate each school day from dismissal until 6 p.m. All students in grades K-2 are eligible to join. More information about pricing is forthcoming. What is the school’s uniform? Students should wear navy blue uniform pants, or knee length skirt for bottoms and either the gray Mastery Prep Elementary polo shirt or the blue Mastery Prep Elementary oxford shirt with the navy blue Mastery Prep Elementary cardigan and tie. Closed-toe shoes only. Will uniform shirts be available to purchase at the school? In order to ensure that our front desk is most efficient to serve your family and our school’s needs, uniforms will not be sold at the school. Please be sure to check the website for specific timelines to ensure that you will get your uniform on time. Will all students be eligible for school lunch? All students attending Mastery Prep Elementary will be eligible to receive free breakfast and lunch. Please be sure to complete the “Household Income Survey” to ensure that we are able to continue to make these meals available to all students. When will I receive school bus information? We are working with the school district to provide school bus transportation to all eligible students. We will be sure to send this information via email and postal service as soon as we have the details. Any student living in Philadelphia is eligible to apply for the lottery at Mastery Prep Elementary, however, preference is given to students living in the 19140 zip code. The deadline to apply to be included in the lottery is January 28, 2019. If you apply after the deadline, you will be added to our waitlist. The lottery will be held on February 14, 2019. For additional questions please reach out to Assistant Principal Sonya Edmonds at [email protected]. Field trips, community meetings and much more! Raymond Fields, Jr. is the founding principal of Mastery Prep Elementary Charter School. He’s looking forward to partnering with parents and finding unique opportunities to spark the creativity and imagination of students through enrichment activities like the arts and karate. 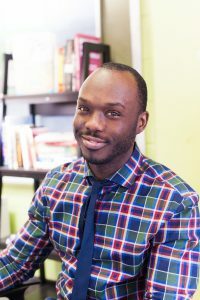 An accomplished school leader, Raymond is a 2018 Neubauer Fellow in Educational Leadership and was part of the 2011 New Leaders for New Schools Leadership Program. He holds a Bachelor of Arts degree in African American Studies & Criminal Justice from the University of Maryland, College Park and Master of Arts in Teaching from Mercer University.